This is why I asked Kixeye to open the game up! All left to do in base is upgrade oil/metal pumps. All images attached is last things to upgrade high levels have nothing to do gets little boring at times! Worst part is no base on the map is ever of use! I am level 45 and getting close to that point. Mostly base upgrades left to do and still need tokens. Most units at level 18 so I still have a ways to go when I can only get 2 tokens at a time. At one time I was almost completely upgraded a few years back and then BOOM they started adding units and levels on to everything. I expect the same when I get that close again. So far no complaints. I keep plenty busy just doing PVE and upgrading. 6+ year player with no breaks in game. First time I think I heard a complaint about needing more to upgrade though lol...show-off. Not trading lol. Yeah the pace of the game is way out of balance these days literally the pace of the game is about non coiners. Levels 21 thru 30 should've been released probably 2 months ago or 3 months ago. When you get to this point nothing you do makes your base stronger or nothing you do attack wise is super relevant to make yourself stronger going from 38 to 40 on a omega unit isn't a drastic difference. Some of the heavy turrets are essentially worthless the way the game is now if you're using a overwatch or flak they provide zilch. Even rail guns not that useful as their rate of fire is too slow. Medals bases maybe once every season you buy some hero tech big deal lol. Game needs to be more challenging and opened up nobody wants upgrades especially the freebie guys, but every player should be getting stronger not sitting in idle mode because kixeye is holding back the pace of the game lol. Makes no sense a business that don't want to earn money. I literally smash higher levels all the time and there is many in game in same boat. Thats nice , i see alot of coining there . Actually now its no coining they don't give us anything to coin lmao whole point here! This post isn't meant to complain its more meant to inform kixeye there is a big player base out there with nothing to do basically and I'm sure thats not what kixeye had in mind for the game! Well, as long as it is only one base I guess there is no issue. But as I said in my comment above "So far no complaints" Kixeye does try even if we don't see it enough. I am sure they don't want problems with their game. Its not just one base is players in almost every sector same as me or close even. Coinings all good but **** bro, you’re literally buying yourself into boredom. Lol, I know that. But still first complaint I heard about it. Need more stuff to upgrade lol. Relax now. You made your point its all good. Maybe they will come out with more platform upgrades or something for ya. I myself would not mind catching up and relaxing a bit. So either way I am good. I never coined an upgrade but if I did I could not complain about everything being upgraded. Not saying you coined anything either. What level ya at anyway to be so far in the game? as I said before I am level 45, daily player since Dec. 2011, 7 digit id ( I may have missed a day or two, now and then) if I have to work out of town I use laptop and at home I have P.C. so its easy to check in once a day if I like. And I mostly upgrade and do PVE. Always have an upgrade going 24/7 so you must be a long time player too. Its my off season now so I play a lot more often then my busy season of course. I love the game even with all its problems/issues. I roll with the flow. I haven't had to coin much in awhile kixeye don't put out enough content literally ya coin maybe few levels on a new unit and its no rush, but is heaps of players in same boat i can name a ton of em. See balance in game right now is goof their isn't much difference between highers and lowers in game which is wierd some of you old timers have put in the work and earned your stuff and they're essentially allowing lowers to compete with some of you guys which shouldn't be the case. Shouldn't be a player in the game that says i cannot make my base stronger lol if their is ever one single player it means kixeye is failing to keep the pace of the game up. One of main issues is alot of input in game comes from lowers. I see it all the time for example like put elite phantom bases back on map stuff like that. 2 units dominate the entire game right now in pvp. Pretty much 2 to 3 units dominate the farming in game. So essentially almost every other unit in game isn't used much. Kixeye did a great thing with warpath love it as do many others problem is warpath isn't frequent enough. Also if a player does great on a event essentially they don't really have to do invasion. So the whole monthly world map becomes useless. Medals are easy enough to do with 2 units. Thor can be done in bulk like 700 mill in 20 mins. Reso is simple. They have to create balance its where they're lacking atm. Players shouldn't be in standstill because they fail to give more upgrades and fail to introduce levels 21 thru 30 so people can earn more tokens. Things like shadow ops they make the bases so easy everyone in the game has the toy lol. So many aspects need to be fixed. In events they introduce one unit only and it goes to one faction should be a unit for every faction would make game fun and actually make the faction thing useful. Alliance raids are pretty much a solo thing as only one person earns diamond tech per raid. This should be changed so e1 doing raid earns diamond tech and its not like diamond tech is that great anyhow lol. In the gear store their should be way more options when you have no reason to earn medals because nothing to buy eliminates a phase from the game include other stuff in there of relevance maybe tokens or hero tokens blood diamond or something. You have to give players options opening up the game gives the lowers a chance to excel more too. If you want the lowers to excel and compete then make the game more cooperative as it stands right now much is solo thing. The pace the game is at right now though is pretty lame lol its meant for all lowers to catch up and benefit those that don't coin. Level 49 been playing since April of 2013 almost 5 years now. Guess I got caught in that level freeze glitch or something. I been playing over a year longer then you and I am 4 levels lower. Takes me like a year to level up. So in 4 more years I should be at your level lol. 10 years to get to level 49. How strange lol. Unless ya spent lots of coin on upgrades. I am rarely online when my upgrades hit and I was told that we don't receive the XP (which we need to level up) unless we are online at the moment the upgrade completes. Seems true enough. My base is so close to maxed out that I don't see much chance of increasing my level much. Maybe someday the XP will kick in and I will log on to see I am a level 50 at least. I sent in a ticket a few years back on this issue but the response was that after level 40 or so it don't really matter. I guess it just matters to me. I did not like that reply at all. Daily player too. *** Join WAR COMMANDER ADDICTS *** page on Facebook. Cheaters and Hackers are not allowed in group. Lvl 20 breachers bruh. Takes 55 tokens to get there let alone the time to upgrade to level 10. Only way I know to get those tokens was from the event. One token at 400k xp. Buy a guitar bro or a drums. There are way better things you can do when you have too much money...But that's everyone's own decision. High levels have plenty left to do. If Kixeye wants to add more levels then they need to change all the old stuff to 5-second thorium upgrades - otherwise more people are going to quit as you push them further behind. In your base would you click on your name in the upper left hand corner and POST the two XP numbers ( You Have & Next Level ) here, Please? I'm trying to see how much Total XP it takes to become a Level 50. I would like to know how much Total XP you need for Level 46. I think I know the amounts but I would like to Verify them for the wiki. This is why its best to find a middle ground when paying to get ahead, getting to far ahead gets boring and in a game thats already getting stale it just sounds like your complaining about your own poor investment choices. I am sure you are in the minority with your lack of upgrades, most of us still have a year or more ahead of us. I started in 2012 and my dozer has not stopped and I still have a huge amount to go. Heavy platforms alone take months to get nowhere. Here is the pic. you requested. (If it inserted correctly). I had the correct amount on the wiki for level 46. I still need to verify the xp for Levels 47 thru 57. I recieve my upgrade xp just fine always have. I have 21 billion xp to go to level 50 that will take a long long time. Look i know the non coiners and the free players will whine no offense but guys like croft provide kixeye with nothing they don't coin. The game needs to be opened up i can name heaps of players that are ahead of me or around the same. The pace of the game is goofy. 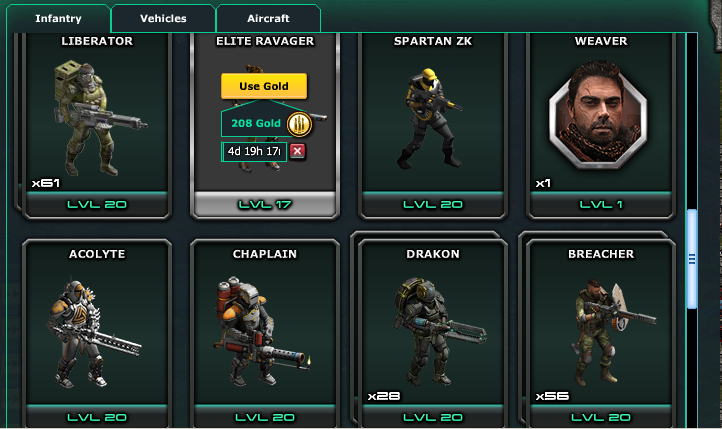 My breachers are level 20 i coined em and yeah i did 23.2 mill xp in the event its not hard just time is all. Basically i have 2 things to do every month the event and smash bases! I have 2k coins on my acc at the moment. Trust me I coin. I just don't coin upgrades anymore as its a futile waste of money. The faster you upgrade the more they throw at you. Can you give me the exact two set of numbers? I would appreciate it a lot.